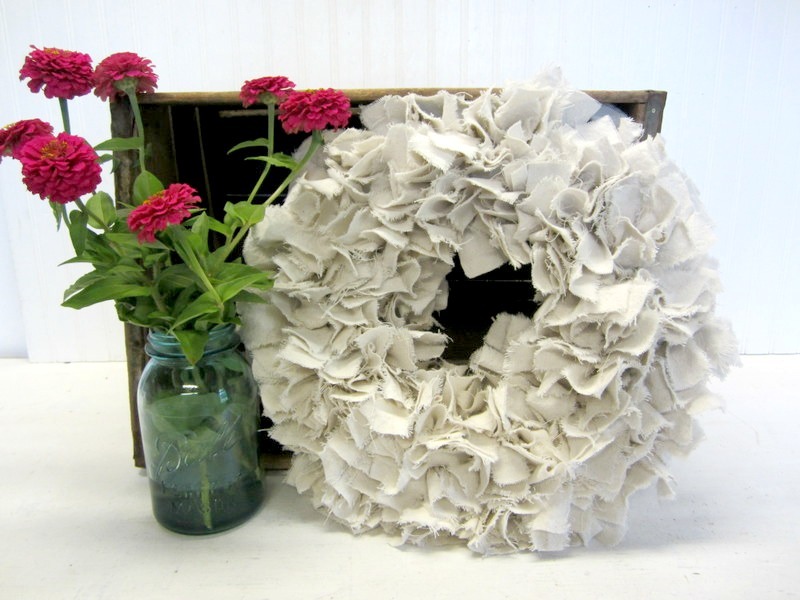 I have made numerous burlap ribbon wreaths this past year using wire forms. (you can see some of them here) While working in my shop one day last week the wire wreath forms kept catching my eye. I got to thinking about what else I could make with them, other than the burlap wreaths and then it hit me. I could cut a drop cloth into long 4" wide strips and use it as the ribbon instead of the burlap. Well, that's not what I did, but I may still try that idea soon. Here's what I did instead. First, I bleached and laundered the drop cloth to soften it. Then I tore long strips of fabric and cut them into smaller pieces. A lot of smaller strips. Then I began to tie each piece around the wire wreath form. ...until the entire form was covered in drop cloth strips. and yes they do shed some if you shake the wreath. 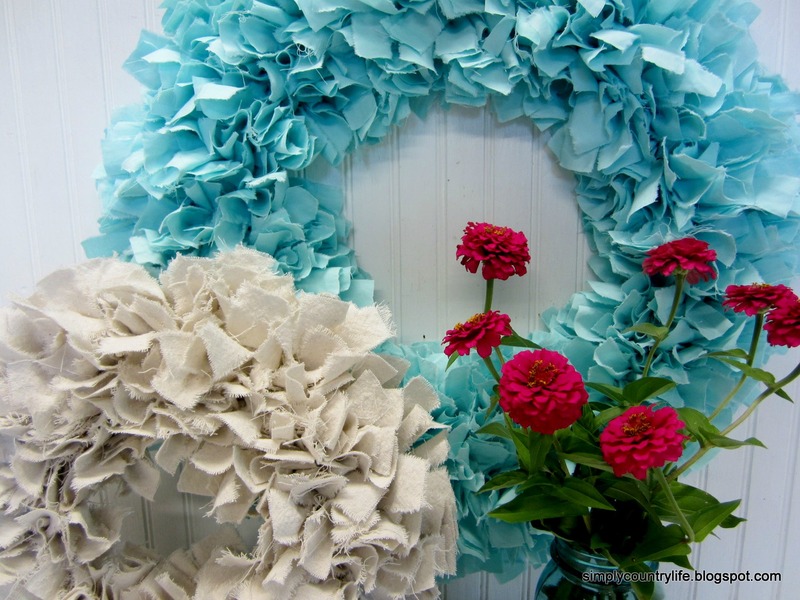 until I searched Pinterest and realized I'm a little late on the rag wreath idea. 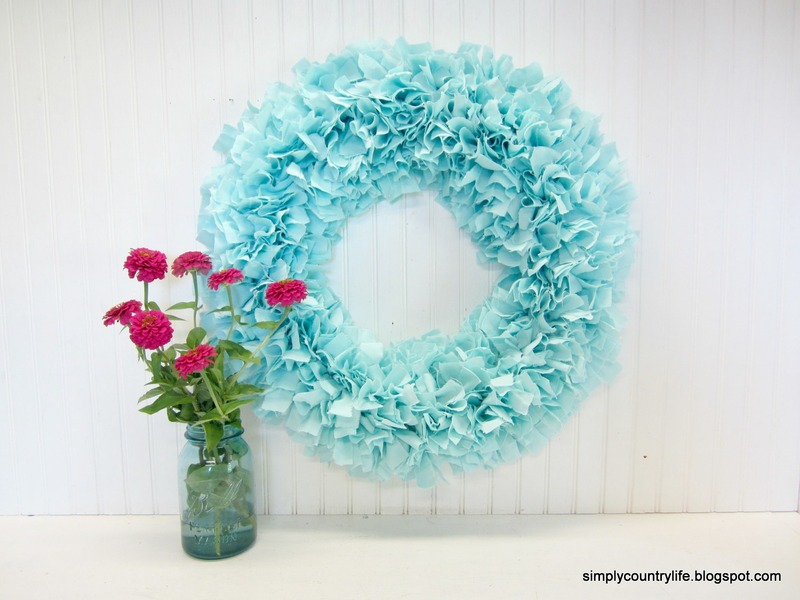 Oh well, they're a new idea to me and I really like how this wreath turned out. I liked it so much that I decided to make a larger one with turquoise fabric. They both have a shabby look to them. I think they would look so pretty hanging over a mirror by a pretty ribbon. Here they are paired together. These two went straight into my Etsy shop. This is adorable, Adina! I'm giving you a shout-out on my FB page tomorrow afternoon here - https://www.facebook.com/KnickofTime. Thanks for sharing it at the Vintage Inspiration Party! Angie, thank you very much! Beautiful! I've been wanting to make one of these forever - I think I found my weekend project! Thanks for the inspiration! Thank you and you are very welcome Amy. I'm sure I'll be making more. I want to make one with strips of vintage lace mixed in with fabric. I am totally inspired to make one for Fall and Christmas Adina!!! I am anxious to make one for the holidays too! Cute idea. I LOVE the turquoise one!! Love this, Adina!! Drop cloths are really an unsung hero in the home decor world! Thanks for linking up at Snickerdoodle Sunday- come back again next week! Thanks Sarah, see you next week!